With the endless cold and rainy weather on Cape Cod last week, our thoughts turned to comfort food and the Hubby dug out the Crockpot. He’s been wanting to make a recipe for braised short ribs he found in the October issue of Bon Appetit, and the weekend was the only time he had to fool around with a recipe that cooks all day. It was a rainy Sunday and we were dualing cooks, with me making our dinner for that night (Apple Squash soup - stayed tuned) and him making dinner for the next night. Working side by side and singing along to the radio, it was the most relaxing time we've had in weeks. He followed the recipe ingredients fairly closely, but once the ingredients were in the pot, that recipe was all his in the finishing touches. I’ve read many places that pot roast is much better if you let it rest for a day, but we’re not usually that kind of plan-a-headers when it comes to meals. Then last winter I had a pot roast I had to cook because its date was up, but we had other plans for dinner. It was the least thought out, quickest pot roast I ever made. And one of the best. I couldn’t believe the difference a day could make. When the meat rests in the sauce overnight it soaks up so much flavor! It’s totally worth waiting for – not that I’m always going to have time for that. It takes true dedication to an excellent pot roast to cook two dinners in one night, even if it does save time the next night. Lately we’ve have a new fan of our cooking. Our teenage daughter’s boyfriend has become a fixture at our table – every night. It’s like we’ve gained a new child to replace the two who have grown and gone. Just to mess with him we require formal wear every night. Just kidding. I’m so busy taking photos of food I forget to take any of people these days. The photo is from prom last May before I became so food obsessed. One night he raved so much about our homemade pickles that we sent him home with a jar. The next day he brought back the empty jar. He ate the whole jar. In one day. It’s hard not to love a kid who loves your food that much. Sprinkle ribs with coarse salt and pepper. Place in an even layer in slow-cooker. Add all ingredients except for mushrooms, cover, and cook on low heat until meat is tender, about 8 hours. If possible store in refrigerator overnight. The next day, remove meat from sauce and place on a plate. Skim fat off top of sauce. Heat the sauce on top of the stove and then blend it with immersion blender. Add ribs to sauce. Saute mushrooms in 1 tablespoon of butter until lightly browned. Add to sauce. Melt 1 tablespoon of butter in microwave. Add 1 tablespoon of flour and mix. Cook in microwave for about one minute or until roux bubbles. Whisk roux into sauce. Simmer for a half an hour and serve with nice crusty bread. What a great post Laurie! I have a love/hate relationship with my crockpot. I love it because of the ease of cooking and the fact that meat gets so tender in the crockpot. I hate it because I feel limited as to what I can cook and sometimes the flavors get lost in the long cooking process. I use it at least once a week though and over the weekend I did a great lentil soup in it. I love your idea about formal wear for dinner! (even if was a joke)And I had no idea that any kids played Scrabble these days. I'm impressed! Hi! Thanks for stopping my blog and saying HI. Nice to see a native cape codder here in food-blogger land. You are the first cape codder I've seen here. I need to get a new crockpot, mine is sooo old. 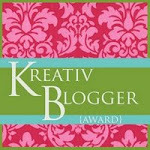 Just posted my award! Thank you SO much! This looks amazing.... I found you through Megan - I will now be a regular. Great blog! These ribs look incredible! Cute picture of your daughter too--she is very pretty. I finally got my award posted and just wanted to say thanks again! That looks so delicious! And as for teenagers, I think they keep hoping that time will just stand still and you won't notice how long he's been there. Sounds like a nice boy though. Lovely daughter too!